​THE MYTH OF QUEEN VICTORIA'S CONNECTION TO THE DOUKHOBORS EXPOSED! WHAT DID QUEEN VICTORIA HAVE TO DO WITH THE DOUKHOBOR MIGRATION? One of the most baffling fantasies that have accompanied accounts of the Doukhobor immigration was the approval of Queen Victoria. Many Doukhobors believe this although none can cite any facts regarding such involvement or how she could have given 'permission' since all immigration at the time was carried out by the Canadian Minister of the Interior, Clifford Sifton. He and Deputy Minister James Smart handled the negotiations in reference to the Doukhobors, and anyone interested in learning more about the process should consult The Promised Land by Pierre Berton, an excellent account of the settling of the Canadian west. Aside from a reference in the Encyclopedia Britannica, there is no mention of the word 'Doukhobor' in the entire Royal Archives, so it is unlikely that Queen Victoria had ever even heard the word. The Doukhobor delegation to Canada consisted of Ivan Ivin and Peter Makhortoff, aided by Prince Hilkov. They had travelled to England, then Cyprus, back to England; then on to Canada, by this time joined by their families and Aylmer Maude, forming a total party of 10. During their time in Canada, they toured the potential site of settlement [free passage arranged by Maude]. While Hilkov and the two Doukhobor families examined the land, Maude and James Mavor had two meetings with James Smart, Deputy Minister of the Interior. The final decision to admit the Doukhobors to Canada as colonists was made in a meeting with Maude and Smart on October 5, and in a further meeting between James Mavor and Clifford Sifton on October 28, 1897. At this time, they also decided upon the three locations of settlement. Needless to say, Queen Victoria, by this time a frail and feeble and slightly delusional 78 years old, and occupied with the South African campaign [to what little extent she could be occupied with anything, she died three years later], was not aware of any dealings of the Canadian negotiations or of the Doukhobor emigration. How do such myths begin, and why would the Doukhobors revere this Queen, the aunt of their energetic tormentor and author of their miseries and suffering, Czar Nicholas II? Having finally escaped his tyranny in Russia, how could they embrace this new monarch as a Savior ? And this coupled with the irony of losing their Saskatchewan lands because they refused to swear allegiance to her son, Edward VII? [All relevant correspondence has been deposited at the University of Calgary Library]. When Clifford Sifton resigned as Minister of the Interior and Superintendent General of Indian Affairs in 1905, he was succeeded by Frank Oliver, a journalist and Member of Parliament for Edmonton. 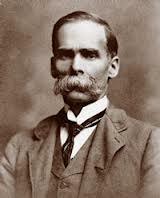 Frank Oliver was born in 1853 in Upper Canada (Ontario) and trained as a journalist in Toronto and Winnipeg before establishing himself in Edmonton in 1880. There, he established the Edmonton Bulletin, a newspaper that he owned until 1923. He died in 1933. Throughout his life, he had a long career in politics, first as Alberta's only Member of Parliament and later as the member for Edmonton. In 1905 he became Minister of the Interior in the Laurier Liberal government. A general movement had begun in the Northwest Territories to preserve western Canada for the British partially fanned by patriotic fervour of the Boer War, [1899-1902] when England retained supremacy in South Africa. This feeling was also abetted by free hold squatters from the U. S. who crossed the open boundary and claimed land by simple possession. They considered themselves more suitable for acquiring land than those ‘foreigners’ from Europe. The concept of ‘Canada for Canadians’ was not new. In 1878, John A. MacDonald was returned to power with this slogan, and ‘Canadians’ primarily meant English. By the time Oliver took office, there was already a hostile response building in the west over the entry of non-British immigrants. With their vastly different customs, language and habits of dress, many of these new immigrants did not assimilate rapidly to British-Canadian norms. Established Anglos, envious of the European settlers’ success, often through cooperative effort, sprang up to preserve and defend "Canadian" language, culture and values. Such cooperative effort was also contrary to the traditional, individualistic free enterprise activity, and was regarded with suspicion. Oliver was able to capitalize on this sentiment. As Minister of the Interior, he dramatically altered the immigration polices established a decade earlier by Sifton. Whereas Sifton had favoured agriculturalists over urban workers and had welcomed many of eastern European origin, Oliver was staunchly British, and his polices favoured nationality over occupational skills and suitability for the often harsh, demanding, pioneering work. Oliver presided over a series of amendments to the Immigration Act between 1906 and 1910 which allowed immigration agents to exclude entrants on a variety of grounds, including moral unfitness, probability of becoming a criminal or ward of the state, and probability of engaging in revolutionary activity. The cumulative effect of these changes was to vastly increase the proportion of immigrants who were of British ancestry, including paupers and those assisted by charitable organizations. Immigration from Central and Eastern Europe was sharply curtailed, and Blacks, Orientals and immigrants from India were virtually barred or subject to prohibitive head taxes. Clifford Sifton had accommodated the Doukhobor's desire for 'land in a bloc' by creating the Hamlet clause, which allowed the Doukhobors to live in a village and farm the surrounding land allotment communally. Oliver cancelled this provision and reverted to the Homestead Act which maintained the settler living individually on his 160 acres, creating a dwelling and cultivating a portion of the land. Oliver was well known for his racist views, noting that the English race was superior on various occasions. The Galicians were the least desirable, and the Doukhobors were only slightly ahead of them as suitable settlers. He noted that the Doukhobors were mostly valuable in the first years of their immigration, when they were breaking the sod. By the third or fourth year they had worn out their usefulness and the more desirable settlers, the English, including those from Ontario, should be welcomed into the west. 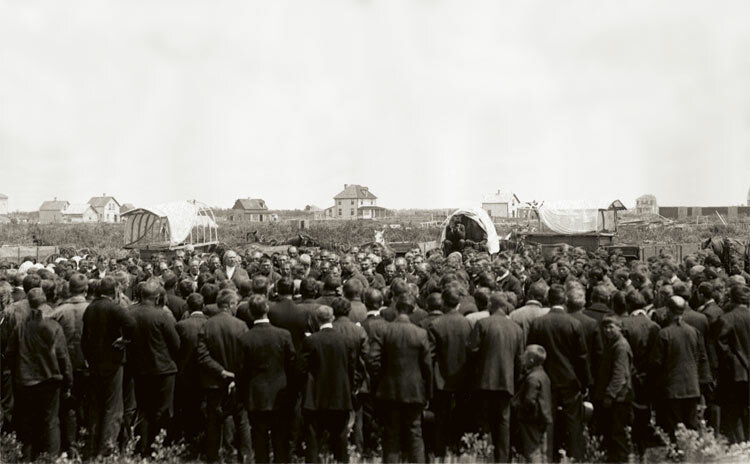 Working with the Reverend John McDougall, he insured that no native reservations were near Edmonton city limits in case the city expanded and there would be difficulty with reservation rights. [The natives were near the bottom of the list in desirability, but were a presence to be dealt with]. It is not surprising that, aided and abetted by the Revered John McDougall, [appointed as special commissioner to the Doukhobors 1906] who had shifted various reservation boundaries to be sure that the most arable land was outside reserve boundaries, he became the architect of the destruction of the Doukhobor communal enterprise in Saskatchewan through the repossession of 258,880 acres of improved land granted under the Hamlet clause by Clifford Sifton. This was done simply by re-introducing and enforcing the Homestead Act, which stipulated individual ownership by a single family member filing for 160 acres, cultivation, paying a fee and swearing the oath of allegiance; conditions that the Doukhobors would have rejected in the original migration negotiations. Between himself and McDougall, they reported to the government that the Doukhobor holdings were not developed up to sufficient cultivation, and this pretext was used to cancel the previous allotments. The ironic factor was that this land was much more valuable now for the very reason that it was under productive cultivation, and that was the reason for repossession, as it was now suitable for less capable but more ‘desirable’ settlers. Another irony was that the ‘more desirable settlers’, speculators among them, were anxious to acquire these properties for resale. The reason for this was that these properties were now adjacent to railroad sidings, the same railroads the Doukhobor immigrants had helped to build in their early years. Previously isolated, the rail links provided easy access for hauling produce to the east and the west, and providing transport for more ‘desirable’ settlers claiming these previously owned properties. By 1919 Doukhobors were barred from voting and further immigration of Doukhobors was disallowed. 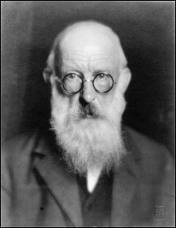 Frank Oliver had established the Edmonton Bulletin in 1880 and used it to propagate his views until 1923. Some sample comments: April 26, 1910, he reports that Doukhobors are not suitable settlers as they are not fit for citizenship. On May 7, 1908 he congratulates Mackenzie King’s trip abroad which included an announcement regarding a restriction on oriental immigration. He concludes that it is better for all concerned that Canada remain a ‘white’ country, white in this case excluding middle Europeans which he refers to as Galicians. One side effect of this new policy were disastrous results with many English immigrants arriving with crystal china and grand pianos [‘pianos instead of ploughs’] with the concept that they would soon be supervising vast country estates as some of their forbears had done in India. They proved that they were totally unsuitable for pioneering work required, and many returned. Many were not able to return because they had exhausted all of their resources, sometimes borrowing money for their passage and for huge fees charged by furtive ‘immigration agents’ who exploited the gullible. Many had to attempt labour they were incapable of and unsuited for, and such workers were famous for their ineptness when they had to appeal for employment from some of the ‘inferior’ farmers, especially at harvest time when such part time help was needed. Others remained as ‘remittance men’ who collected a stipend from their family in England, as long as they stayed abroad, but even they had to work occasionally. In other cases, Oliver’s policy had to be set aside. Although he professed a preference for farmers, many who immigrated during his tenure were unskilled workers or "navvies." As railway construction boomed after 1907, the demand for workers increased mostly because few Canadians of British origin would tolerate the low wages and poor working conditions of the construction camps. Thousands of unskilled labourers were imported to fill the camps. By 1910, the demand was so high that "alien navvies" were afforded unrestricted entry, a policy that was continued after 1911 by the Conservative government of Robert Borden until the outbreak of war in 1914. When the demand for cheap labour was over, restrictions were resumed. Such is one chapter of our Canadian settlement. In 1907, as the Doukhobors pondered their fate facing the cancellation of 2500 homestead entries representing over 300,000 acres of improved land, James Mavor tried to rally support for their cause. He had been active in the immigration process, working with Leo Tolstoy and Peter Kropotkin as the Canadian connection for the immigration committee. He had visited their settlements in the Northwest Territories and was impressed with their progress. Now the Dominion government was reneging on its promise of settlement under the Hamlet Clause and arbitrarily cancelling homestead entries which were not entered by individuals. The Right Hon. Sir Wilfred Laurier G.C.M.G. I take the liberty of sending you a copy of a circular letter which I have sent to several members of the Cabinet now in Ottawa. The matter is so urgent that I trust you will pardon me for troubling you with it at a moment when you must be fully engaged. The main facts as I understand them are. 1. 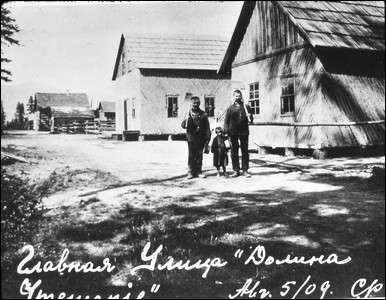 The “village system” was an absolute condition of the Doukhobor immigration. It was agreed upon most explicitly by the Department and acted upon fully in the settlement of the people. In the region which was allowed to them by the Government any other system would have been wholly impracticable, at that time viz in 1899. 2. Mr Sifton’s Dispatch of 15th February 1902, is looked upon by the Doukhobors as a kind of charter and on the faith of this they have purchased large quantities of agricultural implements etc. 3. The land in question have been made the subject of homestead entry act of the necessary amount of cultivation according to the [?] of the Home-stead Inspections. 4. The fees for the Homestead Entries have been paid. Under these circumstances to cancel the entries and resume possession of the land, cannot be considered otherwise than as an act of deliberate confiscation. Not only would it be a breach of faith on the part of the Government but it would of necessity create a spirit of uneasiness as well among the immigrants and new settlers in general as among the Doukhobors. It appears to me with all respect, that the country would not get over the discredit of it. I understand that there are among you a few people who object to making an individual entry for a homestead. I do not understand why these people refused the free gift of land by the Canadian government, as my government promised your people before they left Russia that this would be done, and when I offer the land to you free of charge it is refused by some of them. I am pleased to see however that a large number are not ungrateful or unmindful of the interests of their community, and that most of the Doukhobors will make their entry for homesteads even though they afterwards give the land to trustees. And I have decided that those who will take their homesteads and accept free land from the government may live together in one or more villages, and instead of being compelled to cultivate each quarter section held by each Doukhobor, that the land around the village itself may be cultivated and the work which otherwise would be required on each individual homestead may be done altogether around the village. But it would not be fair that those who take up their homesteads and live in their village should be troubled with those who will not do so and as those who do not take up a homestead will not be protected by the government after the first of May this year [but] they will simply have to leave the villages to those who take up the homesteads and buy land elsewhere from some other person. If for instance a village wants fifty homesteads around the village, I will be satisfied if the amount of improvements required on each quarter-section is done around the village, only for the whole fifty. This would enable all those in the village to live together and to work together in and around the village without being compelled to go a long way out to their individual homesteads. I have taken this preliminary step of bringing the matter before some of the members of the Cabinet and I have sent a copy of this letter to Mr. Oliver. I wait to hear what steps are being taken in the matter. I may add I have been made aware of the recent interviews between the Doukhobor delegates and Mr. Oliver and with their unsatisfactory result. It does not seem to me that the public will receive with equanimity the statement which will certainly be made namely that the Department of the Interior is confiscating on a technical pretext 100,000 acres of land from settlers to which it had been granted, who had cultivated the necessary portion of it and who had paid the necessary fees. The unsettling effect of this upon recent settlers who had previously supposed their homesteads to be inviolable and upon intending immigrants who were relying upon the good faith of the government and its agents may quite easily be imagined. The breach of faith must inevitably be advertised widely both in Europe and in America with highly injurious results to Canadian interests, to say nothing of the shock to the public conscience of the folly and iniquity of depriving 1000 families of simple-minded peasants of their means of livelihood. Of course, I cannot be supposed to have been made aware of all the intricacies of Doukhobor affairs but from what I do know it seems to me that the Minister of the Interior does not in the least realize that he is putting his head into a hornets` nest, from which he cannot withdraw it uninjured. It seems to me at the very least that this whole question ought to be referred to a Commission of responsible persons who will take the trouble to go into the whole case, all notices being meanwhile withdrawn. 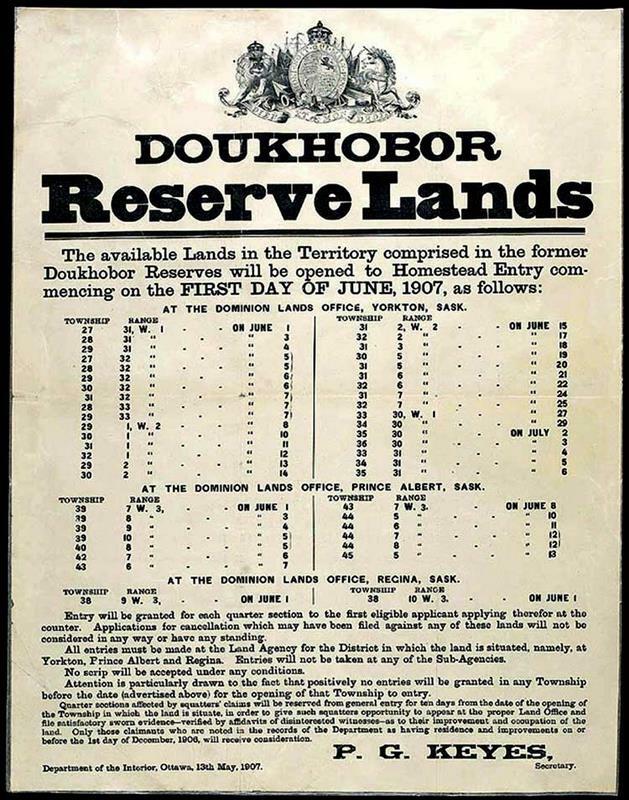 After the enforced resettlement to British Columbia, consideration was given to Doukhobor land expropriation to be given to returning veterans. James Mavor wrote another letter urging the government to reconsider such a reactionary move. I desire to appeal to the high-minded public of Canada to prevent, as they can, if they will, the perpetration of what appears to me to be a monstrous national crime. It is known that between 7,000 and 8,000 Doukhobors emigrated from Russia in 1899. The oppression they endured from the government there was well known and they applied to be allotted to come to this country. They made two conditions, both of which were accepted by the Minister of the Interior of the time. The first of these conditions - exemption from military service - was embodied in an Order-in-Council. The second condition - freedom to settle in villages - was as fully accepted, although it was not embodied in so formal a document. When they came the people were received with open arms. The immigration was the largest which had ever come to Canada in one mass. The fame of Canada as the refuge of the unfortunate was spread and even trumpeted throughout the world. Other circumstances, no doubt conspired, but the Doukhobor immigration represented the beginning of a great movement, from Europe which was looked upon at the time as of the utmost importance in building up this country. The European immigrants built the railways in the North-west and contributed enormously to the increase of production. Had this immigration not taken place it is doubtful if the North-west would now have been in the economical position in which it finds itself. 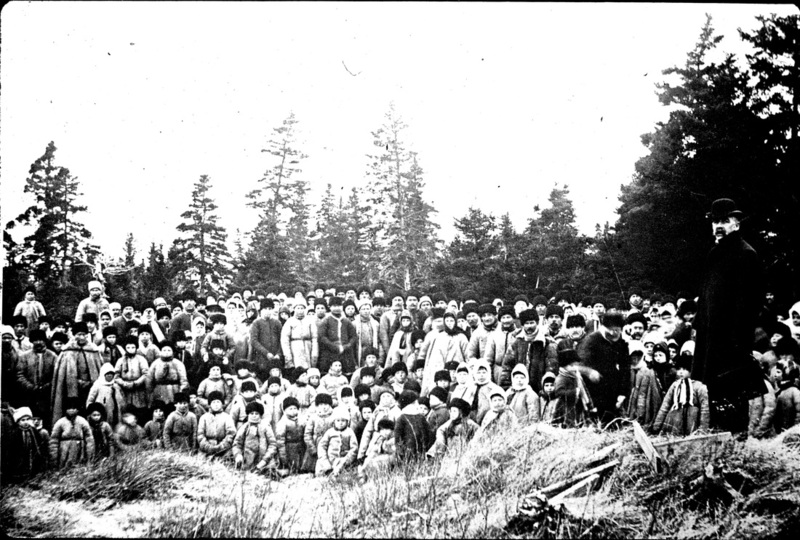 Whether the disturbance to their village and family life due to the frequent harassing conduct of the Russian Government affected their minds or not, it is the fact that for some years before and for some years after their arrival in Canada, the Doukhobors were subject to outbreaks of religious fanaticism. These outbreaks did not, however, affect more than one-fifth to one-quarter of the people and in no case were the outbreaks of long duration. There have been no outbreaks for several years. 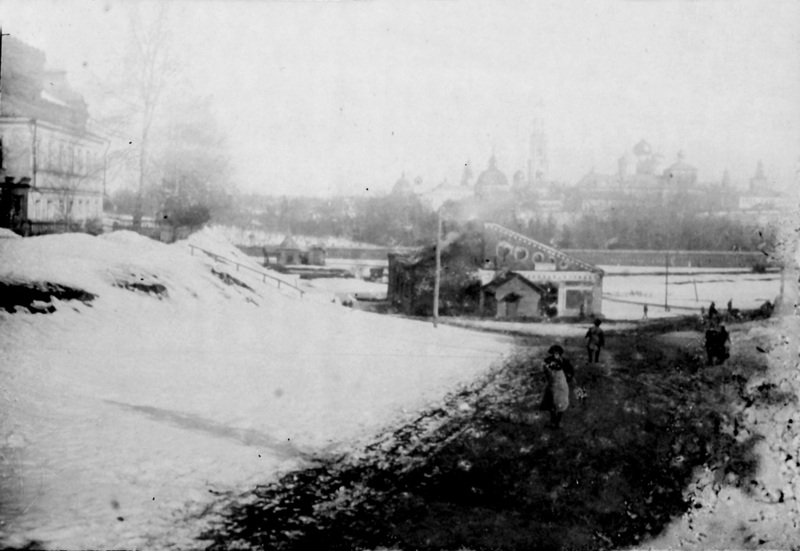 When the arrangements were being made about their settlement, I was invited by the Department of the Interior to make some suggestions; and I suggested that the land allotted to the Doukhobors should be on the outer limit of what was considered by the Government surveyors, at that time, as suitable for practical settlement. I pointed out that the fact of their being a "hard knot" in a country otherwise occupied by farmers cultivating individually, would not be so inconvenient as it might be if the settlement were in the heart of the country, and that the area intervening between the existing settlements and the Doukhobor lands would be filled up all the more readily, if they were beyond that area. This suggestion was adopted, and the anticipation proved to be correct. The intervening area did fill up very rapidly and the lands quickly rose in value. What I did not anticipate was that the Government would break faith with the people so soon and becoming subject to pressure by land speculators, seek to deprive the Doukhobors of the lands which had been given to them, or explicitly reserved for them. Had I done so, nothing would have induced me to encourage any immigrants to come to this country. The process of attacks upon the Doukhobor lands began in 1906. It is necessary to explain certain peculiarities before it. About there-fourths of them practiced rigid co-operation. They bought collectively and they sold collectively. The local merchants disliked them because they did not profit by their proximity on account of the purchases of Doukhobors being made principally in Toronto and Vancouver, where, soon after their settlement, they began to buy on a large scale. The local farmers professed to believe that the sale by Doukhobors produced reduced prices. Together with the land speculators - many farmers being among these - and aided by the local politicians, the groups mentioned organized a raid upon Sir Wilfred Laurier and Mr. Frank Oliver. Neither of these had ever been in the Doukhobor Settlement, nor did they know anything about the people or their character. The Doukhobors had no votes because they objected to the oath of allegiance - conceiving that to swear it, gave the Government a power over them which they could not understand. For this reason their case was regarded with cynical indifference. Instead of dealing with the question in a diplomatic manner, the Government in 1907, simply cancelled the Doukhobor grants and took away from the people nearly 400,000 acres of land. Large areas of that land had been brought into cultivation by the people. Technically the Government may have acted within their powers - morally, their action was without justification. One of the peculiarities of the Doukhobors is adherence to the maxim of Tolstoy, by whom in recent years they have been much influenced - that maxim is "Resist not evil." They accepted the situation and of course believed that like the Government of Russia - the Canadian Government was simply an instrument of oppression. They decided that even the small portion of land left to them was held an very insecure tenure and therefore they should buy land in British Columbia from and with the knowledge of the Government of that province. They were well advised, at all events for the time, for in 1912 further encroachment upon their Saskatchewan lands was made, at the instance of Conservative Politicians and others. Some thousands of Doukhobors were transferred to the British Columbia lands. There they engaged in the intensive agriculture to which they had been accustomed in Russia, this form of agriculture not being possible in northern Saskatchewan. They established large fruit farms, built a jam factory and produced on a large scale. During the war they presented the Government with great quantities of jam as their contribution to the war fund. Now comes the crime - these peaceable if obstinate and peculiar people are being forced out of their purchased lands as they were forced out of their homesteads by the same conspiracy of local tradesmen, local farmers, local Politicians and local speculators. These people have entertained the idea of exploiting the returned soldier in order to deprive the Doukhobors of their cultivated lands. The intention of the scheme is obvious as it is discreditable. On the plea that the returned soldier must have land, they have induced the Government to buy out the Doukhobors at forced sale, and then give the returned soldiers grants of their land. The experience of such military grants in this country and elsewhere, is that the soldier quickly realizes upon his grant and then the opportunity of the speculator comes. He buys the grants thus suddenly thrown upon the market, at a low price, and holds the land for a profit, meanwhile allowing it to fall out of cultivation. There is plenty of land in British Columbia and in the northwest for all the returned soldiers who genuinely desire to settle down to an agricultural life. 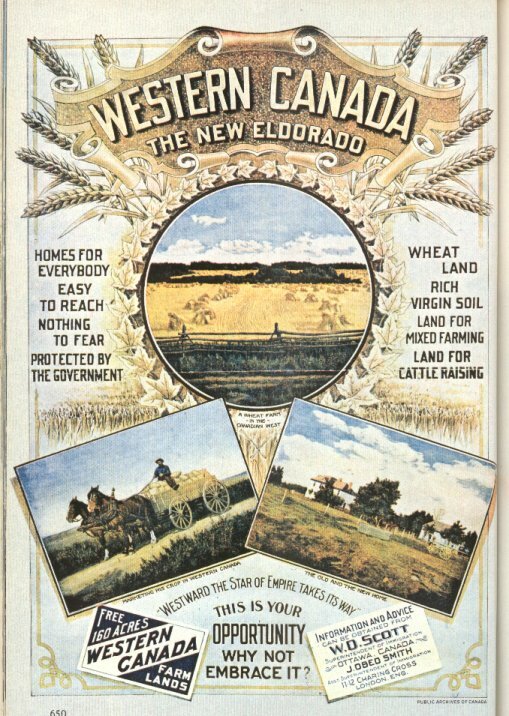 They should be generously treated in the distribution of land but there can be no sound policy in turning out established settlers who are making a success of intensive cultivation and who have bought and paid for their land believing in the good faith of the people of Canada and in their respect for civil rights. The soldier, unless he is also a politician, may find his grant similarly expropriated and the plea that he has not fulfilled precisely all the conditions. This country needs immigrants to occupy its wide spaces; how can they be expected to come, if the prospect lies before them of being deprived an one excuse or another of their homesteads or even of the lands they have paid for? What are dispossessed Doukhobors to do? They cannot go back to Russia, the conditions there would be for them not any better than they are here. It is useless for them to think of buying land in this country, because some plausible excuse might at any time be invited to deprive them of it in the same way as is being done now. They must inevitably be turned into vagrants - unable to obtain land in a country where there are millions of acres waiting for the plough. The life of these unfortunate people has been again and again torn up by the roots, not only in Russia, but in this country, by the action of the respective Governments. It is little wonder that they distrust the organization of the State. Their experience of it has been that when for some reason its attention is spasmodically drawn to them, it is an occasion merely an instrument of oppression and disturbance. The short-sighted policy of the Government with regard to the Doukhobors during the past thirteen years has borne the fruit, that this adverse or even perverse view of the state has been strongly confirmed in the minds of the Doukhobors, and if the policy is further persisted it must affect in a similar way others who are not so simple-minded as they are. The distrust inspired in their minds by the past actions of the Government has a great deal to do with their objections to the education of their children, as well as with their isolation from their neighbours. They may be self-righteous and afflicted with spiritual pride; but they feel, and have reason to feel, that they have been, and are now being, treated without regard to justice by their neighbours, and through their influence, by the Government. These proceedings have nothing in common with a policy of "reconstruction", on the contrary they amount to deliberate destruction. If the Government expropriated the fruit farms in the Niagara District, turned the farmers adrift, and bestowed the land in grants to returned soldiers with the liberty to sell to speculators, the case would be precisely similar. Care for our returned men is a national duty; it cannot with justice be made a special burden upon a few. Disregard of civil rights is an infectious disease. When a Government breaks the fundamental laws of a country and of society, it is little wonder that law in general should be held in light esteem. If Canada is ever to be emancipated from slavery to the petty politician whose eye is bent exclusively an the main chance, this can only be done by a wider and less self-interested public opinion making its influence felt upon the Government. This seems to be an occasion when such influence ought somehow to be made manifest. If there is anything to be done, there is no time to be lost. Appraisers sent by the Dominion Government are already on the spot estimating the value of the land which is intended to be confiscated. The whole matter has been rushed with indecent haste. I would suggest that the Dominion Government institute without delay a serious inquiry conducted by competent persons into the whole circumstances of the case. Canada cannot afford to have its public character compromised by a transaction which will not bear the light of day. The fact that the people who have been and are being again plundered, are innocent, inoffensive, industrious people unacquainted with political guile, ought to make every high-minded citizen of this country insist upon justice being done them and upon their right in the enjoyment of their peaceful and productive life. Anyone interested to know more about the above author, Prof. James Mavor, can refer to CANADIAN SLAVONIC PAPERS, Vol. 1, published by the University of Toronto Press or research the Thomas Fisher Rare Books Library at the University of Toronto. Travelling to the meeting . . THE DOUKHOBOR MIGRATION TO B. C.
Report of General Meeting of the Doukhobor Community held at Verigin, January 25th, 1910. The following archive was first published in the Winnipeg Free Press in March, 1910. There were present one-man delegate and one-woman from each village, also some honorary members. The number of people attending was about fifty men and fifty women. The meeting was opened by each person reading a Psalm, and all joining in the singing of the hymn, "Glory to God", and by common expressions of hearty gratitude to God for the success of present life. After this there was long and serious conversation in regard to the universal meaning of Christ's teaching. It was clearly explained from the conversations that Christ in His teachings gave us to understand that God is a universal God. So there were some examples taken from the life of people before Christ's time. People at that time understood Divinity as a destructive force, taking for instance the worshipping of thunder, winds, fire and other elements. People of such belief often themselves committed actions of destructions. Wars and ether illegal actions were allowed. Christ clearly explained to us that the most superior force, by which the universe is Ruled, is the force of good and people wishing to worship this good force must first themselves be good. By doing so one would become nearer and adapt himself to the good force of the universe what is called "God". The winds and thunder are temporary occurrences, but the world is guarded by this force of Good. After that, various questions of economy were presented to the meeting for consideration. (1) It was stated to the meeting that this year was closed by the payment of all Debts in full, the funds for which came from outside works and the sale of grain. (2) The delegates from each village presented a report of the quantity of wheat, oats, barley, flax, peas, etc remaining. (3) It was decided by all present that from this date until the arrival of new crops, six bushels of wheat be retained for the personal use of each person, and that in the spring one bushel of wheat and one bushel of barley be sown for each individual: the remainder of the land to be sown in oats. Flax and peas can be sown in accordance with the desire of each village. The majority of the members of the meeting expressed their wish that each village should keep on sowing flax and peas, and, to keep feed for the stock, one hundred bushels of oats for each team of horses and fifty bushels of barley for each yoke of oxen. (4) it was decided that by the 15th of February each village must have the grain for people, seed grain, grain for horses and oxen separated. The seed grain must be carefully cleaned and stored in good granaries, and all balance of grain in each village, after 15th February will be hauled to railroad points for sale. As per the reports the community has at present, the grain for sale will amount to seventy five thousand dollars. Shipments of grain will be made as heretofore, through the community offices. All moneys received from the sale of grain will be deposited with the Home Bank of Canada at Winnipeg and withdrawn when required. (5) All merchandise will be purchased, as before, through the community office at Verigin and those villages, which have credit accounts, will receive goods to the value of same. All villages having a credit account, are willing that goods be bought for villages which have none. And in view of this it was decided at this meeting that no person should purchase goods individually. (6) An inventory of all property belonging to the community beyond the village outfits was made and is attached to general accounts. (7) The community has in all villages about four hundred teams of working horses, valued at $350.00 per team, which amounts to one hundred and forty thousand dollars, five hundred yokes of oxen, valued at $100.00 per yoke, amounts to fifty thousand dollars, five hundred milk cows, valued at $35.00 each, amounts to seventeen thousand and five thousand dollars. Besides that there are full outfits for horses and oxen as: harness, farm implements, wagons, sleighs, etc. All affairs of the community consisting of 42 villages are in good shape. (8) The community accounts for 1909 were presented by V. A. Potapoff, S. Reibin and M. W. Cazakoff. Accounts were found correct in every respect and approved by all present. The copy is attached here within. (9) Vasil Potapoff and Simeon Reibin requested the meeting to allow them to resign their positions. Their resignations were very reluctantly accepted, and the meeting tendered them a hearty vote of thanks in acknowledgement of their services in the interest of the community in the past. (10) It was decided to proceed with the election of managers of the community affairs. The following were elected for 1914 for purchasing goods and implements and distributing same to villages: Nicholas Fofonoff, of village Vernoe, Vasil Hleboff of village Lubovnoe, John Podovinikoff, who was in office at Verigin before, Alex Reibin, of village Vosnisennie, Pard Potakoff, of village Bogomdannoe, M. W. Cazakoff was re-elected as a manager of office and ministerial affairs. (11) As the community had good heavy crops and fall success in life during the year 1909, it was decided by all those present to send no men on outside work this coming summer, but instead to increase cultivation acreage at home. (12) It was decided by this meeting to deliver to Verigin flour mill all wheat in excess of amount reserved for the purpose of grinding and selling the flour. Prices on wheat were set as follows: For highest-grade 85¢ per bushel, and for second grade 80¢ per bushel. The villages situated at the north colony will receive for long hauling 10¢ per bushel extra, and villages Tambovkia, Trudohubivoe, Vossianie, and Petrovo and Voskresinie 5¢ per bushel extra. (13) The question was raised before the meeting regard to the immigration to British Columbia. 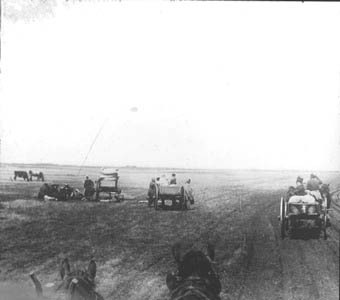 It was definitely shown that in Saskatchewan where the Doukhobors live at present, in consequences of wide prairies lying a considerable distance from the sea, the climate in winter is very dry and cold, the temperature is often over 30 degrees Reaumur, and therefore some sickness prevails, such as bad coughs and rheumatism. 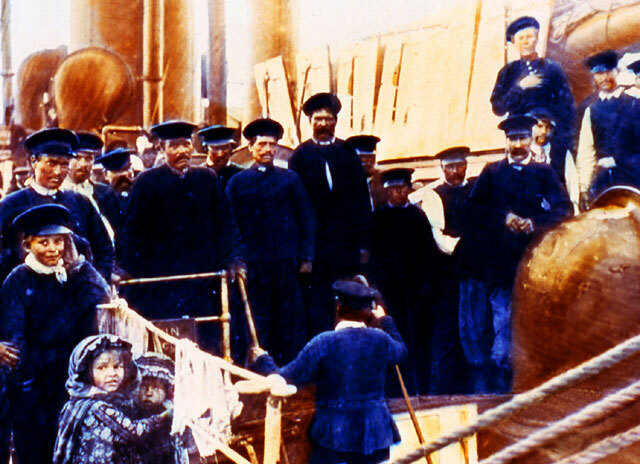 Immigration to British Columbia was decided as most necessary. A particular report of the British Columbia climate was submitted by Peter V. Verigin and by Nicholas Ziberoff, delegates from British Columbia. 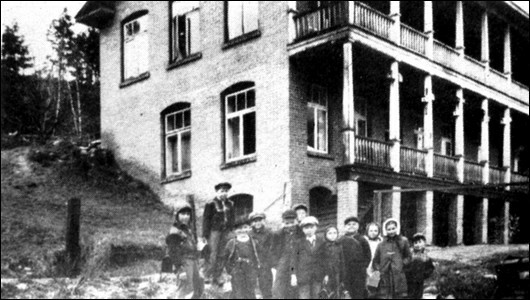 The first party of community Doukhobors immigrated to British Columbia for the purpose of starting works, and has been living there for two years. They have found the climate exceedingly mild in winter: temperatures not being over 15 degrees Reaumur. This occurs about ten times during all the winter, but generally, the temperature is 3, 5 and 7 degrees below zero Reaumur, and sometimes 2, 3 and 7 degrees above zero Reaumur. In consequence of the mountains, the water for drinking is very pure, and the air also very clear and healthy. The reporter, Peter Verigin, is under the impression that the air and waters are similar to those in Switzerland in nature, and even much more healthy. Therefore, with the view to become healthier, immigration to British Columbia has been decided on possibly sooner than intended. In British Columbia it is possible to grow fruits of nearly all kinds: apples, pears, plums, cherries, etc. Small. fruits and vegetables are grown wonderfully good. The community has already bought about ten thousand acres of fruit lands. There is splendid timber on it for building purposes. Toward the close of the meeting there were several conversations in regard to the necessity of the moral enlightenment of the Doukhobors as a Christian Community of the Universal Brotherhood. As already stated, God is universally good, and consequently his followers also must be good, which is their superior degree of nobleness and enlightenment. Such followers of spiritual necessity must not be blood-thirsty, and therefore their food must not be slaughterous. A person whose object is to be pure in spirit, must also be anxious about cleanliness of his body, as for instance, all houses as far as possible clean, especially in living rooms the air always must be as like as possible to the outside air, which is given by the Lord for the nourishing of all people and animal. We deem necessary the water in every village must be kept in clean wells. It is also necessary that every well must be laid round inside with stones or brick, and good pumps installed. The meeting continued four days. It was open every day for eight hours. With sincere wishes for every success from the Lord in their future life and with greeting to all brothers and sisters in every village, the meeting was brought to a close. Free Press, Winnipeg, March 1, 1910. In the Centennial year of 1967, the Castlegar News ran the following article saluting the primary Doukhobor settlement of the area. Although they were not the first white settlers in the community, the Doukhobors were a part of the early pioneers of the area. Their particular distinction was that they were the largest group that settled here in the early years at one time. According to the recollections of some of the remaining oldsters, facilities and all things in general were certainly a far cry from what they are at present. Eli Yakovlevitch Voykin, now in his 82nd year and still hale and hearty and residing in the Pass Creek district, has some very vivid memories of those first years. 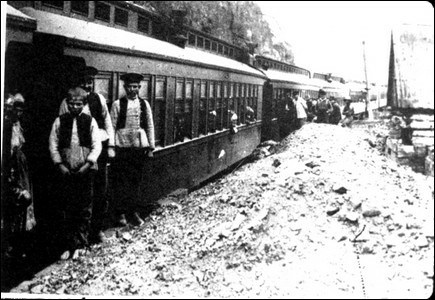 Their group came from the northern Saskatchewan colony (generally referred to as the Prince Albert colony) by passenger train via North Battleford, Edmonton and Revelstoke. Nikifor Ivanovitch Kootnekoff, now a resident at Grand Forks, although somewhat bent with age in his 81st year, nevertheless still retains a lively memory and with nostalgia recalls many experiences of those first years. The Kinnaird station at that time was an old, out-of-use railway car taken off its wheels and set beside the tracks as a shelter of sorts for passengers going on to Rossland. Nearby was the water and irrigation supply that had served the mining camp and which the farmers were also using. Together, the source of supply and various turning points were cleaned and the water facilities expanded. For transportation across the river a ferry was built through cooperative efforts. The site for it was sort of chosen for them beforehand since there had been already a start made by someone. The start was a huge log pillar that had already been prepared in the ground to hold the cable on the Kinnaird side. A similar pillar was dug in on the other side, a cable was strung and a ferry of crude ax hewn timber beams was in operation before the end of the summer of 1908. The Doukhobor oldster cannot recall the name of the chief "architect" of this first ferry. They only remember him as a Frenchman with an oversize, but marvelously kept mustache, whom Mr. Landis later asked to help supervise the Doukhobor carpenters in making the ferry. The ferry had to be constructed the first year because of various needs of transportation across the river. One particular hardship was to transport the first horses across. Even on this boat-barge, this was risky business with a less trained animal. The first horses the Doukhobors took across were taken by tying them behind the boat and making them swim. There was one despairing time during the ferry's early operations when the cable snapped from the Kinnaird side while going across with a load. But fortunately the cable did not let go of the ferry completely and it was swung pendulum-wise downstream to the other shore. However, it was repaired in a sturdier manner and it gave many years of excellent service. The first party of Doukhobors who came in the spring of 1908 was comprised of about 100 working men and 12 women cooks. Their first shelter was in the abandoned mine camp buildings and they immediately set about establishing their own village site. They built their first buildings out of rough hewn logs, of which there was certainly a plentiful supply at every turn. The largest part of Waterloo Flats required the most strenuous kind of clearing operations. An unbelievable part of it was done by actual manpower and hand labour, with the most limited amount of basic hand tools like axes, saws and spades. Later, of course, horsepower was used extensively, using the most ingenious kinds of simple leverage systems to move large logs, pull stumps etc. One of the first modes of monetary earnings of the Doukhobors was from selling cord wood to Cominco at Trail. They transported the cord wood to Trail by floating it downstream on very crude barges of logs tied together with wire and in some places simply woven together with slender willow switches. The Doukhobors grew their first gardens on a spot on the second bench which they referred to as "The Clover Patch." It yielded enough vegetables to feed the whole group through their first winter. The first potatoes they used upon arrival in the spring of 1908 were dug from a patch that Mr. Landis left undug over winter, because he did not need them and which he told the Doukhobors they could have. The potatoes had survived the winter in the ground remarkably well and the Doukhobors were very thankful to Mr. Landis for his kindness in letting them have them. The wild berry crops were very plentiful during the first summer, particularly the huckleberry preserves which were made, besides all that were used for immediate eating. 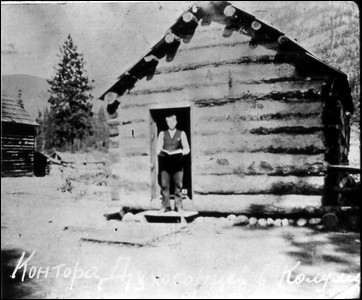 In 1909, together with Hiram Landis who also bought a parcel of land for himself there (and soon moved there), Peter Lordly Verigin purchased on behalf of the Doukhobor community a large tract of land in the Pass Creek area. There was only a pack trail (part of the Dewdney Trail) to this area at the time. The site now known as Glade, was also purchased by the Doukhobor community and this immediately presented a problem wherein the Kinnaird crossing of the river was not at all a central point for the three main Doukhobor properties. 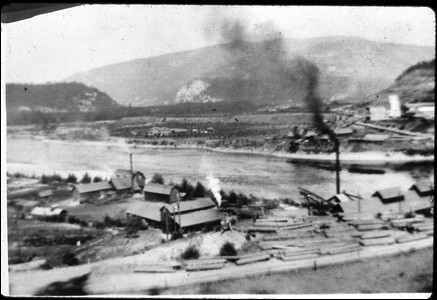 In the summer of 1910 a site on the Kootenay river, above where it joins with the Columbia, was chosen and another ferry was built here. There had been an Indian family living in this vicinity, on the Waterloo Flats side, but they had packed all their belongings into a boat and went away upstream on the Columbia river, the first summer that the Doukhobor settled here. After the ferry was put into operation at this site an application was made by the Doukhobor community to the CPR for a railway station and a rail siding at this point. The CPR agreed and a railway station was built. Peter Lordly Verigin had first thought of naming the station "Kavkaz," in memory of the area that the Doukhobors came from in Russia but his firmly established and life long staunch friend Hiram Landis felt that a foreign sounding name would always be mispronounced and have a certain amount of stigma to it. Mr. Verigin agreed, and in meditating more on the name most suited for the site, suggested "Brilliant' which comes to one’s mind in thinking of the brilliant, sparkling waters of the Kootenay river. Mr. Landis thought this was an excellent name for the new railway station and so Brilliant it was named. Mr. Landis kept the closest contact with the Doukhobor people throughout his whole life and when he passed away his funeral rites were practically all fulfilled by the Doukhobors. All his three sons married Doukhobor girls and two of them still reside in the Salmo area. The first few years saw a mass of major projects put into existence. A small sawmill was put up near the first place of settlement and was replaced by a larger sawmill on the second bench in a year's time. The water supply was added to by the building of a large reservoir. Other sawmills were put into operation. 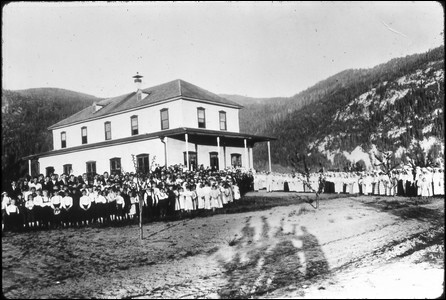 A large prayer home and community centre was erected on the site where the Castlegar Airport now stands. The Brilliant bridge was originally designed, built and serviced by the Doukhobor community. *** It was completed around 1912. Waterloo Flats was cleared of timber and brought under cultivation. Peter Lordly Verigin gave these flats the new name of "Ootisheniya" valley, which in Russian means the valley that gives comfort or consolation: “the Valley of Consolation." Also, in Russian, it was not exactly referred to as a valley. It was called "Dolyina Ootisheniya " "Dolyina" meaning narrow strip of land or a narrow plain. With the opening of the bridge and the completion of the immense water project piped from Pass Creek, the 0otischenia (as it is now spelled) Valley, was brought into fruit and agricultural production. Heavier soil with rotted leaves and grass, rich in humus, was hauled load after load from the Pass Creek area and spread as fertilizer on the lighter sandy soil of the valley and with ample irrigation, bountiful crops of fruit and vegetables were produced. 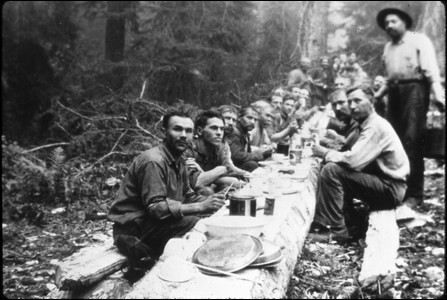 Soon were erected a flour mill, a grain elevator, the noted KC Jam Factory, a wooden irrigation pipe factory, several sawmills up the Slocan Valley and around Nelson and in general the communal structure known as the Christian Community of the Brotherhood**** came into being. It flourished until the depression of the 1930's and at its peak its assets in the three provinces totaled up to	$10 million.